This is part four of a 10-part series chronicling the R&D of a wave energy converter. Read parts one, two, and three. Final design of the team’s wave energy converter, with lots of help and inspiration from the MBARI team. At the end of part 3 of this series, our team of mechanical engineering students were cruising down Highway 101 towards Moss Landing for a 10 a.m. meeting at the world-renowned Monterey Bay Aquarium Research Institute (MBARI). We had been invited by Dr. Andrew Hamilton and his colleague Francois Cazenave, who had both worked to develop a 500-watt wave energy converter (WEC) at MBARI and successfully conducted extended ocean trials. During this meeting, our team planned to present our own research and design concepts to Dr. Hamilton and Mr. Cazenave to see if they had any suggestions or advice before moving ahead with final construction. When we reached the facility, the group was both excited and also apprehensive about the meeting. Over the last 12 weeks we had worked together to create computer simulations and CAD drawings to explain how the system would be assembled and operate, but the true test would be implementing our designs to make them robust enough to withstand the extreme ocean conditions. 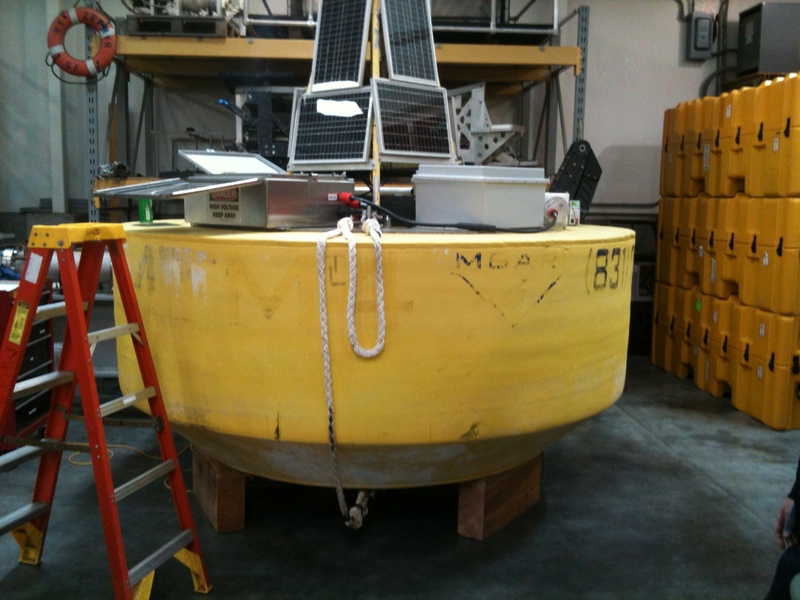 The large buoy for the MBARI wave energy converter project. Not having much ocean engineering experience, I was afraid that we might be oversimplifying the problem at hand or, even worse, not truly aware of all the considerations and issues associated with building a machine for the ocean. Building a hydraulic-electronic-mechanical system on land is challenging enough, but trying to make a waterproof, corrosion-resistant, buoyant device adds a whole list of complexities. By meeting with Dr. Hamilton and Mr. Cazenave, I was hoping we could tackle some of these ocean-specific questions and get a better handle on these issues. The MBARI facility is an amazing place, filled with ocean scientist and engineers working on projects that range from studying ocean acidification and aquatic chemistry to building underwater remote operate vehicles (ROVS) and studying global sea patterns and trends. Before sitting down to discuss our WEC design, Mr. Cazenave gave us a general tour of the labs and talked about the history of the research center. After the tour we walked over to a large industrial building that was more like a small airplane hanger to see the MBARI wave energy converter up close. Their WEC system was much larger than I had expected. The buoy was gigantic, at least 5 feet tall with a large solar array and massive steel boxes mounted on top. The solid yellow foam disc took up the entire corner of the building and was so big you had to stand on a ladder just to see all the electronics and sensors mounted on top. The section of the WEC that normally attached to the bottom of the buoy, the spar, was laid down on its side and spanned nearly 30 feet with all the hydraulics and steel frame component fully assembled. 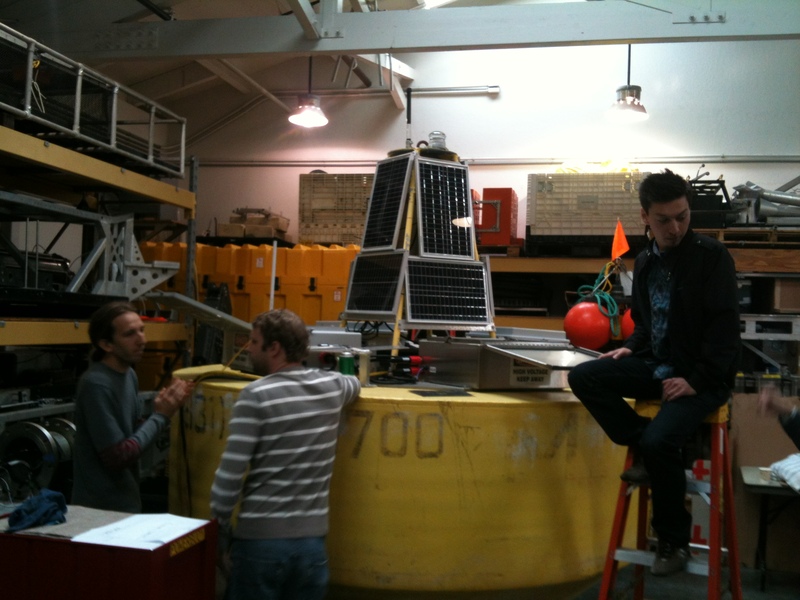 Francios Cazenave (left) patiently answering questions from team member Tom Rumble as Kevin Quach (right) gets a closer look at the electronics mounted on top of the buoy. All of a sudden, our normally quiet, shy group of students suddenly burst out with a million questions directed at the calm and composed Mr. Cazenave. “What type of hydraulic motor did you use?” “How do you store the electricity?” “What is this thing?” After Mr. Casanave patiently answered all of our questions, we broke for a lunch break and let the information soak in. After lunch, we walked past the 20-meter-deep dive tank, through the ROV research lab, and found a small conference room with a gorgeous beachside view of the Monterey Bay. Team member Kevin Quach whipped out his laptop and opened the slideshow we had prepared for the meeting. This was the moment of truth, the entire reason for our visit to this amazing research facility, to pitch our plans to these two experts and see if we could get their stamp of approval. 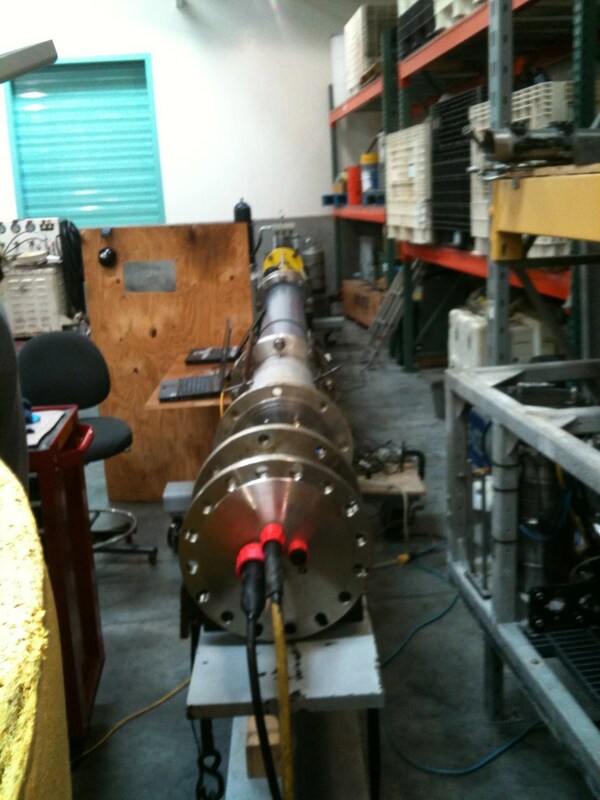 The spar from the MBARI wave energy converter project resting horizontal on a test bench. The five of us took turns speaking, talking about the specific areas of the project that we had focused on. Kevin discussed the spar design and how we had chosen to use HPDE pipe for the main spar section, while Teresa Yeh discussed the electrical generation system and reasons for selecting a marine-grade alternator. Team member Tom Rumble followed up with explaining the hydraulic system design and the need for four check values to regulate the fluid flow in order for the alternator to spin in one direction. And lastly Alex Beckerman talked about the details of the heave plate design and how we planed to construct it from sheet steel and angled struts. Throughout the presentation both Dr. Hamilton and Mr. Cazenave had been asking questions for clarification and casually interjecting opinions, but once the presentation had formally ended, Dr. Hamilton was the first one to really let us know what they thought about the entire design. He started by congratulating us for having been ambitious enough to try and tackle this project, and commended us on our efforts so far on the reasoning we had used to develop our designs. Close-up view of the thick, insulated electrical connections used to prevent fraying from the movement of the buoy. But (and there was a big but) we were missing a few key concepts, along with some of our simpler ideas that were just bad. To start with, early on in the design stage we had decided to make our spar neutrally buoyant so that it would naturally float in the water with the buoy moving up and down on the outside as waves would pass by. This eliminated the need to include springs or some other device to recenter the buoy and spar at the midway point before the next wave would come by and push the buoy up and pump the hydraulic cylinder. However, using a basic mass-spring-damper model that we leaned about in our enginerring dynamics class, Dr. Hamilton illustrated that withouth a “spring” built into our system somewhere, it would be difficult for the buoy to return to a middle position before the next wave moved past the WEC, and instead the buoy and spar would move together with the buoy stuck at the top of the spar. So, for the first change, we needed to incorporate a restoring force to push the buoy back down to the middle position and reset it in the middle of the spar so that the next time a wave moved by, the buoy would be ready to move up and pump the hydraulic ram. Eventually, this took the form of five automotive car springs stacked together so that at the top of a wave crest the hydraulic ram would extend, compressing the springs which then pushed the ram back to the fully compresses position. 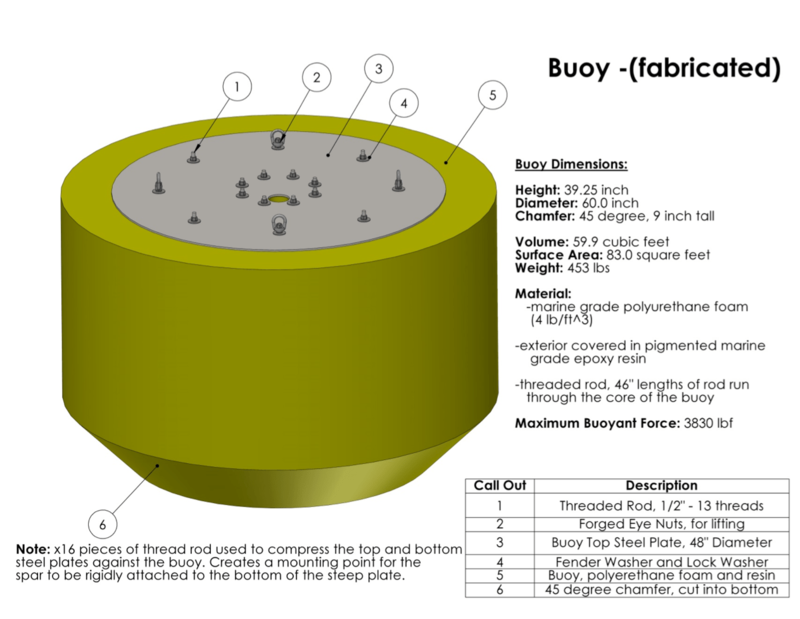 Final design for the team’s buoy, changed from a donut to a solid cylinder. Using the same spring-mass-damper model, it was possible to mathematically determine the optimal mass of the heave plate and spar together and extend the dynamic model to include a two body-mass-spring-damper system. From two body-mass-spring-damper system we would be able to derive characteristic equations of motion to predict how the buoy and spar plus heave plate would move in ideal ocean waves. A new computer simulation could be created within the MatLab software, and this would help us determine the optimal motor size and other related hydraulic components. The current design also used rubber rollers to keep the donut shaped buoy concentrically aligned with the spar, restricting the buoy to only move up and down in ocean waves. Based on their experience, both Dr. Hamilton and Mr. Cazenava expressed concern that these rollers would jam or become clogged with algae and debris, even during short periods of testing, and eventually fail. Additionally, it could be quite difficult to ensure proper alignment of the rollers during fabrication, making this a challenging and difficult design to implement. 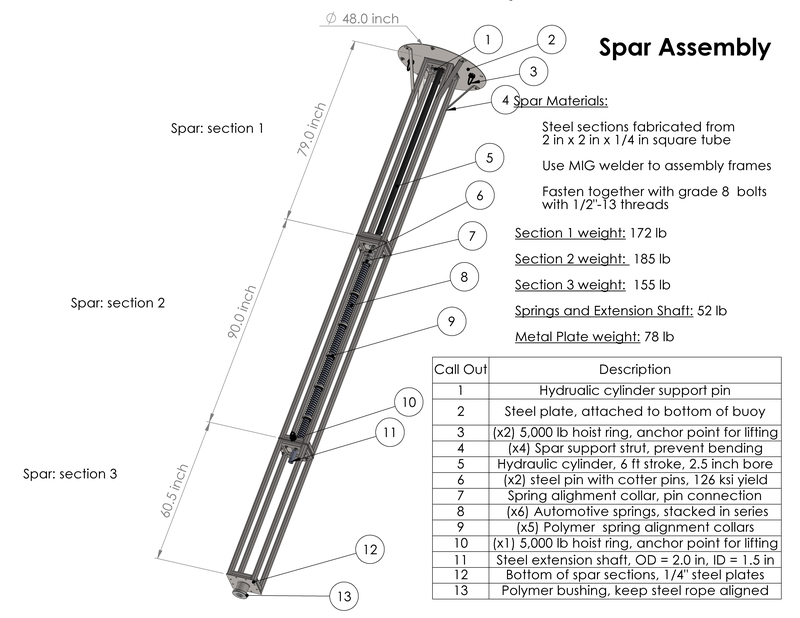 Final design for the spar assembly that rigidly mounts to the underside of the buoy. A more resilient solution was needed and since the team had to add the springs to include a restoring force, the neutrally buoyant idea was turning out to be a flop. With their generous permission and consent, we adopted a similar setup to the MBARI buoy-spar configuration with a buoy floating at the surface and the spar bolted underneath the water. 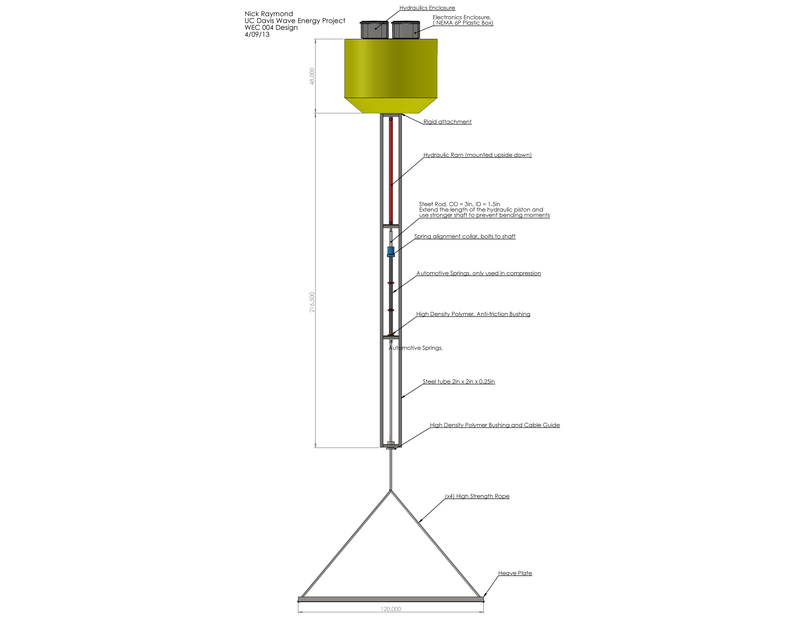 For our design, the spar was rigidly mounted to the underside of the buoy to eliminate the need for a flexible joint. The rigid connection also ensured that the hydraulic hoses and electrical connections between the spar and buoy would not fray or break due to flexing or bending at the coupling. Our initial design for the heave plate was deemed too flimsy and not sturdy enough to withstand the extreme ocean forces. The MBARI project used thick slabs of steel welded to two I-beams to create a heavy, indestructible heave plate. Due to weight limitations and transportation concerns, we replaced our larger, thin plate for a modular design made from 2″x2″ square tubbing that we bolted together. Dr. Hamilton also pointed out that it was more desirable to have the heave plate as deep as possible where the water would be more calm compared to the surface waves. Initially the plate was only 20 feet deep and was expected to bounce up and down in the water column. The final revision included steel cables that lowered the plate more than 45 feet in the water. 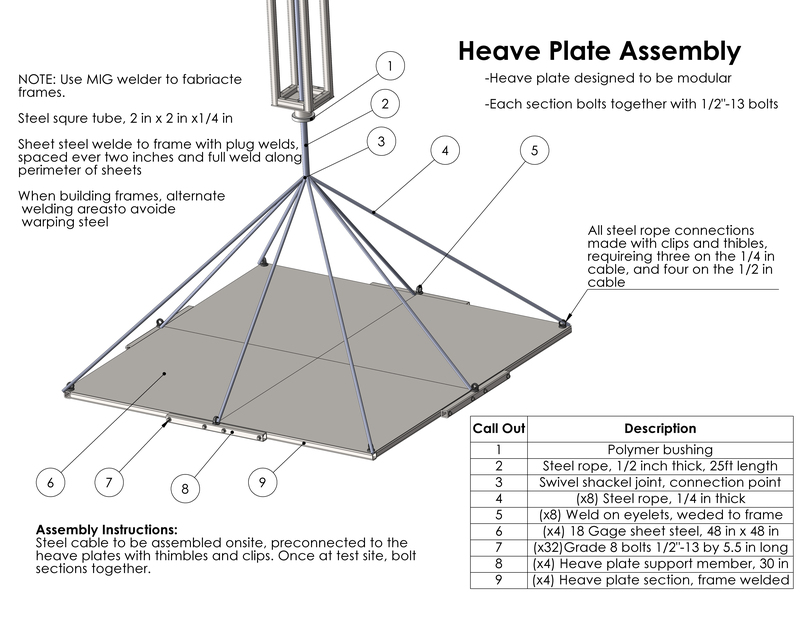 Final design for the heave plate assembly with four modules bolted together for easy transportation. Collecting and storing the energy was going to be a challenge. The WEC’s power production was directly related to the size and period of the waves so we expected that the electricity would need to be rectified and filtered before it was suitable for charging deep-cycle marine batteries. Having seen other student teams attempt to tackle this same problem, Dr. Hamilton suggested that we simply focus on measuring the generated power and forget about trying to actually capture and store the energy using batteries. By hooking up a large 1500-watt resistor to act as a “dummy” load we could measure the voltage drop across the resistor and calculate the instantaneous power using Ohms law to solve for power: Power = Voltage^2/Resistance. At first we planned to use an alternator running in one direction because this would provide a regulated 14V DC, which was ideal for charing the 12V marine batteries. However, since we were no longer charging batteries and the alternator did not produce electricity below 500 RPM, we decided to use a permanent magnet brushless DC motor as our generator. 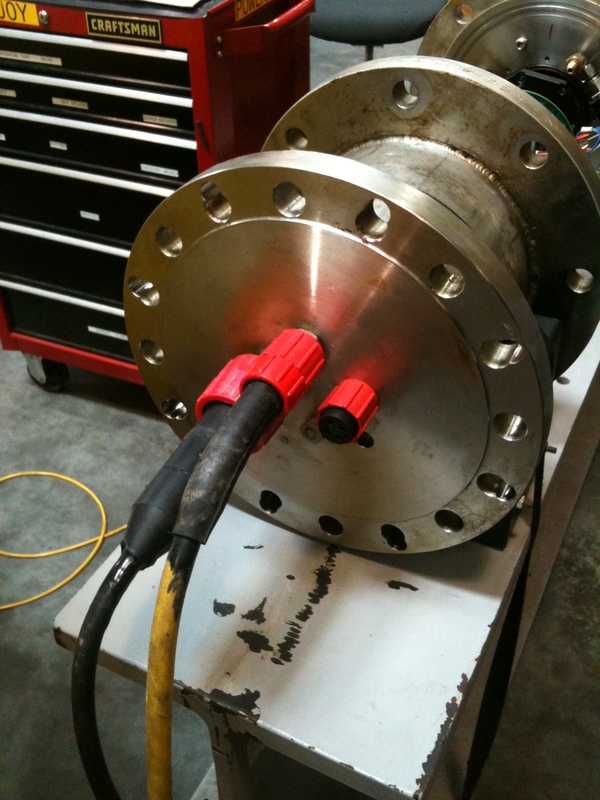 By connecting the output shaft of the hydraulic motor to the shaft of the permanent magnet brushless DC motor we would run the motor backwards and use it a generator. Best of all, it would produce electricity even at very low RPMs. 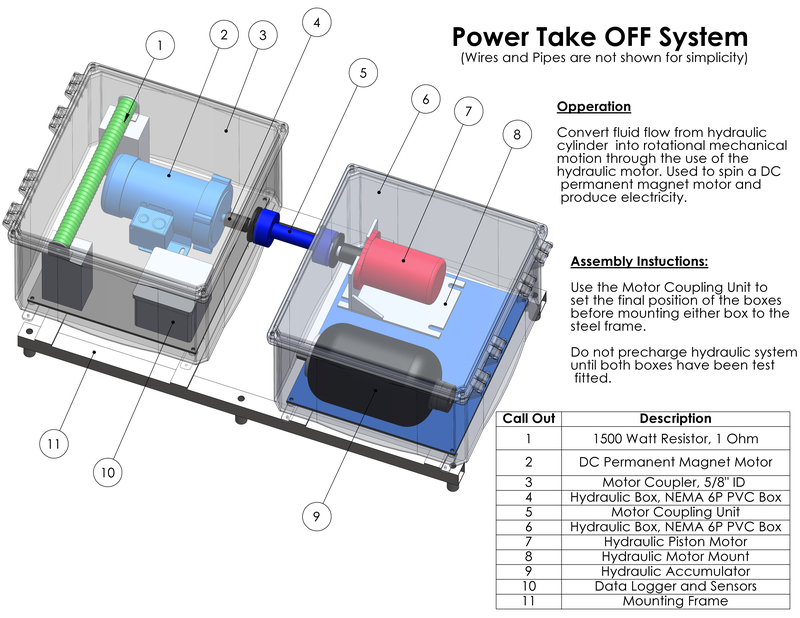 Redesign to the power take-off system (PTO) with the DC motor being used as a generator. Thanks to the insight and advice from Dr. Hamilton and Mr. Cazenave, we left MBARI with a list of critical changes and fixes. My fears had been confirmed — we indeed had been oversimplifying the problem and were not truly aware of all the considerations and issues associated with building a machine for the ocean. However, despite the fact that the entire system had to be overhauled in less than two weeks (we had to start ordering parts and building! ), I felt even more enthusiastic and optimistic. Before heading home the jubilant team stopped off at the beach and found a rolling sand dune to sit and ponder all that had just happened. We left our pencils and paper in the car, and talked for an hour, drawing pictures in the sand. We all felt like we did during the first few weeks of the project when everyone was excited and clamoring to share their ideas, except this time instead of fumbling for the right words we were all speaking the same jargon and able to express our ideas in a way that was easy to understand. After our trip to MBARI, what took us 12 weeks and three attempts to engineer was redesigned for a fourth and final time in less than 14 days. That was it — we had our final design. Next step was building a big yellow buoy.